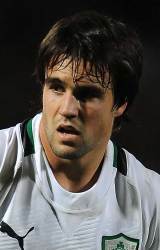 Munster's young scrum-half was the World Cup bolter for the 2011 tournament. With just two appearances for the national side, Murray impressed in what turned out to be a dismal warm-up to the 2011 showpiece tournament. Though having played alongside the likes of Ronan O'Gara and with Peter Stringer ahead of him in the Thomond Park pecking order, Murray has learnt from the best. He duely grabbed the starting shirt midway through the World Cup and was first-choice ahead of Eoin Reddan for the quarter-final defeat to Wales. Murray started in Ireland's first three Six Nations matches the following February but missed the matches against England and Scotland. Murray's hold on the Ireland No.9 shirt tightened and he went on to start Ireland's next ten internationals to put him in contention for a place in the British & Irish Lions squad to tour Australia. And his form earned his a place in Warren Gatland's squad, seeing off the likes of Danny Care and Greig Laidlaw as one of three scrum-halves selected.